The most consistent problem found during a home inspection is not one that would cause great concern for most home buyers, but it is annoying: design mistakes which look bad. If you have followed the news lately, you may have noticed that many builders are going out of business or firms are merging. Many of these firms were the big production builders, who massed produce homes in their eleven step programs usually at the edges of our city where land was cheap. I could easily criticize them for many things; however, I do think that their methods can be used to produce affordable homes for first time home buyers. Many of the problems that I found with these homes came from the fact that the workers did not receive training on how to properly use and install systems in a house. The worst offense along this line was the crew who used duct tape to repair a foundation that had cracked into four pieces. Most of the time though these homes were put together well. As a home inspector, it is my job to point out flaws like the one mentioned, but I wish that I could point out stupid designs. The utility room by the front door, huge bedroom windows from two homes looking directly into each other, and the wall of south facing windows which will cause large air conditioning bills are a few that I can name. I frequently point these items out on my report or in my talk to a buyer, but I try to emphasize that they are not issues like structural concerns. Fortunately, you can remodel your home or take other design steps (like decorating) to mitigate this lack of thought on the part of the builder. I wanted to go over three common things that I encounter during an inspection, and then offer a possible solution. You might find that you can live with these mistakes, but maybe after reading the following paragraphs, you may begin to think about you own home and its design. I have come to believe that people have a love/hate relationship with their gutters. Gutters take a lot of abuse. I seem to always be marking down something about the gutters in my reports. Often it is that they need cleaning. This has prompted many of my clients to say that they think it might be better to remove the gutter system from the house, but I advise against this. In fact, I generally tell people to add more gutters to a home. They can be the best way to direct water from the home. However, there is one installation method that irks me, and you can see it in this picture. This is the front path/sidewalk leading to the front door. The garage wall is on the right. The downspout will pour its water out onto that path. What will happen when someone is walking on that path during the rain? They will have to deal with that water. If the cement has any kind of depression, or if water can stay on that path for awhile, you can have a slippery spot after the rain. If the water could have been directed to a downspout not on a path (which can be done during the gutter installation), this situation would have been corrected. In my opinion, the best solution would be to create a drain system which goes under the sidewalk. The sidewalk is not that deep, so creating a channel through it takes a bit of effort, but not beyond the means of a DIY project. Once the channel has been created, run a drainage tube from the downspout. The channel can be made all the way to the street to allow water to flow out (best option), or the tube could surface on the other side of the walkway allowing water to flow down the yard to the street. Once the tube is in place, you can wrap it with landscape cloth before placing mortar over it to recreate the sidewalk. Do your walls line up with the foundation? I see this more often on homes built in the last ten years. 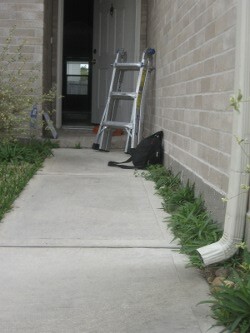 In the photo, you will see the wall by a garage door, but something similar can happen to any wall. You have one crew come in to pour the foundation. The next crew completes the framing. Then the plumber, electrician, and HVAC techs will do their rough ins. The framing crew comes back to add the exterior sheathing. Everyone working off of their own set of plans, thinking that they have the measurements right. When the crew lays the bricks, they discover that the bricks are hanging over the foundation. Your exterior brick wall is not (or at least, it is not supposed to) supporting the weight of the house. It is cosmetic for appearance. One technique used to de-emphasize this mistake is to have the buttercoat on the foundation bow out to meet the bricks. 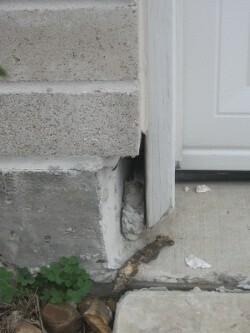 The buttercoat is the cement covering on your foundation used to improve its appearance. In the case of the photo, you would have to several inches of cement to pour to match it to the wall. You could do this by making a frame from cardboard, enclosing the space to be filled with cement. You may consider making a trim piece from wood to cover the opening. You may even be able to fill in this space with a brick. I think a simple wood trim is the easiest option. Interior layouts which do not correlate to the exterior design. I one time knew an architect who was a little vague about the projects that he was developing. He worked in commercial designs, like office buildings. He finally admitted that his job was to design the bathrooms. Actually, he did much more for the firm, and there is more to bathroom planning than what you might think, but telling someone that is what you do for a living does not sound so glamorous. I feel that production builders used plans from firms where several architects worked on the home in a production style themselves, and they did not consider what they were doing. I am sure that each one had a reason for his elements on a plan, but it would leave some odd spaces. One home that I inspected last month really left me wondering. To keep a design flow in the facade, windows were placed in evenly along the second floor. A bedroom on the left side of the home had a closet nearly coming to the wall where the window was. To prevent the closet wall covering nearly a fourth of the window, a space was created of ten inches wide by thirty-six inches deep. You could still see the closet wall through the window from the outside, and the space was wasted. In the diagram below you can see ways that the closet could have been incorporated into the room, which would have allowed for better use of the window. On a funny note: the wall opposite of the closet had a huge space (3.5’x 5′) between the two rooms. The closet could have been built into it. It was being used as an air duct for a return. Remodelling does not have to be a difficult process. If you are adding a room or you have a project over $10,000, you will want professionals involved. At that point you will be needing building permits as well. The closet rearrangement would not be too hard. The closet walls in the room would not be load bearing, but it would take a little education. Many building centers have manuals that can describe the steps involved in framing and such. The project may last more than a weekend though. You may not have the tools, and you may want to go slow to get it done properly. On the other hand, a remodeling professional may do the job for cheaper than you think. This entry was posted on Tuesday, April 21st, 2009 at 1:03 pm	and is filed under Home Maintenance-Consumer Info. You can follow any responses to this entry through the RSS 2.0 feed.